I have been writing this blog for almost ten years! For most of that time, my workflow for writing and reviewing drafts has revolved around my email inbox. I write a draft and then hand it off to the Product Manager for review. The Product Manager, in turn, will hand the draft off to their team and to other stakeholders and reviewers within the company. Given the pace of AWS development, I often have between five and ten drafts underway at any given time. Reconciling overlapping suggestions for edits, sometimes spread across multiple drafts is tedious and error-prone. It is clear to me (and to my colleagues) that email inboxes are not appropriate venues for efficiently and securely sharing and reviewing complex documents. We decided to “scratch our own itch” and to create a document hub that would relieve the load on our inboxes and also add some structure to the process. Given that our enterprise customers have been asking us to provide them with secure storage and sharing, we decided to build a new product! 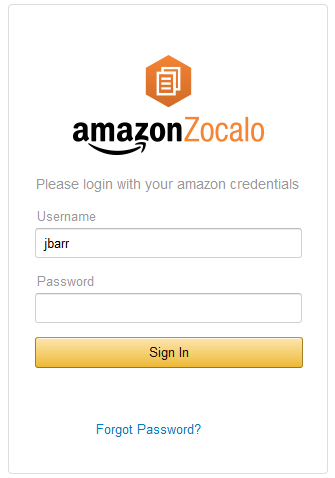 Today we are introducing Amazon Zocalo. This is a fully managed, secure document storage and sharing service designed specifically for the needs of the enterprise. As you will see as you review this post, Zocalo provides users with secure access to documents, regardless of their location, device, or formal relationship to the organization. 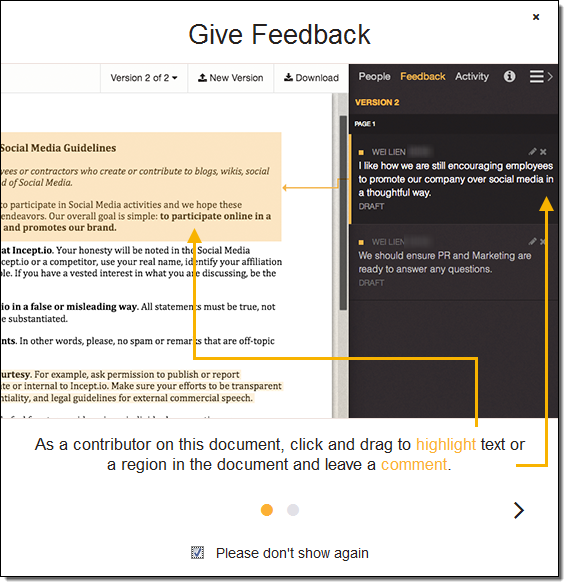 As the owner of a document, you can selectively share it with others (inside or outside of your organization), and you can ask them for feedback, optionally subject to a deadline that you specify. Zocalo gives you simple, straightforward access to your documents anytime and from anywhere, regardless of location or device. Zocalo supports versioned review and markup of a multitude of document types, and was designed to allow security-conscious administrators to control and audit access to accounts and documents. With centralized user management (optionally linked to your existing Active Directory) and tight control over sharing, Zocalo prevents boundaries from becoming accidentally blurred. 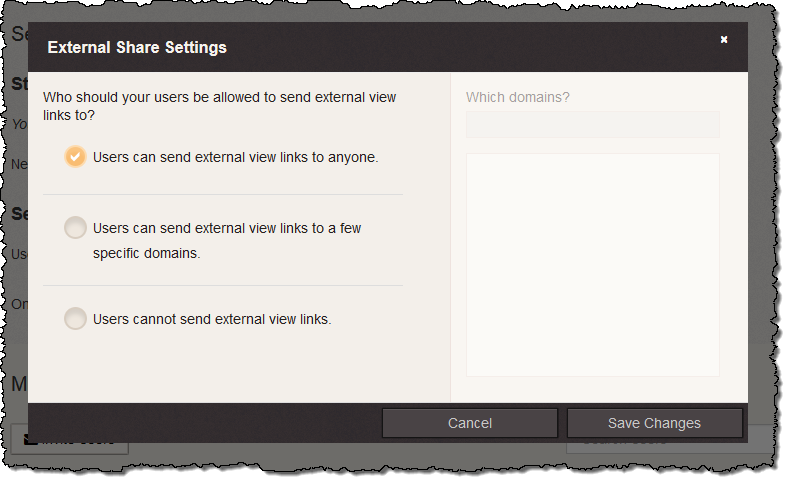 All documents are stored in a designated AWS Region and transmitted in encrypted form. You, as the document owner, can even opt to disallow downloading for extra protection. 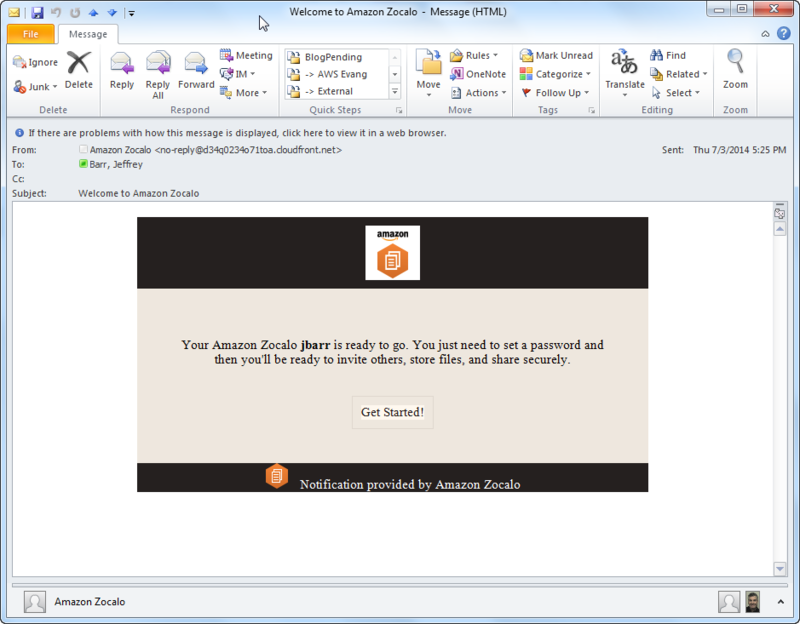 You can install the Zocalo client application on your desktop and laptop computers running Windows 7 or MacOS (version 10.7 or later) and designate a folder for syncing. Once you do so, saving a file to the folder will automatically upload them to Zocalo across an encrypted connection and sync them to your other devices. You can also access Zocalo from your iPad, Kindle Fire, and Android tablets. In the remainder of this post I will take a look at Zocalo from three points of view. 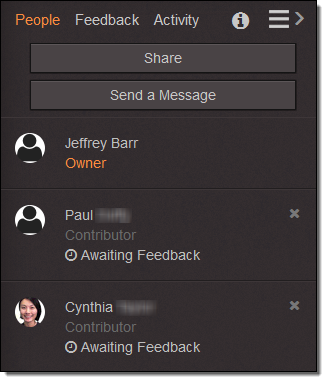 You will see what it is like to be a document owner, a reviewer, and a Zocalo administrator. Zocalo can accommodate files of up to 5 GB. 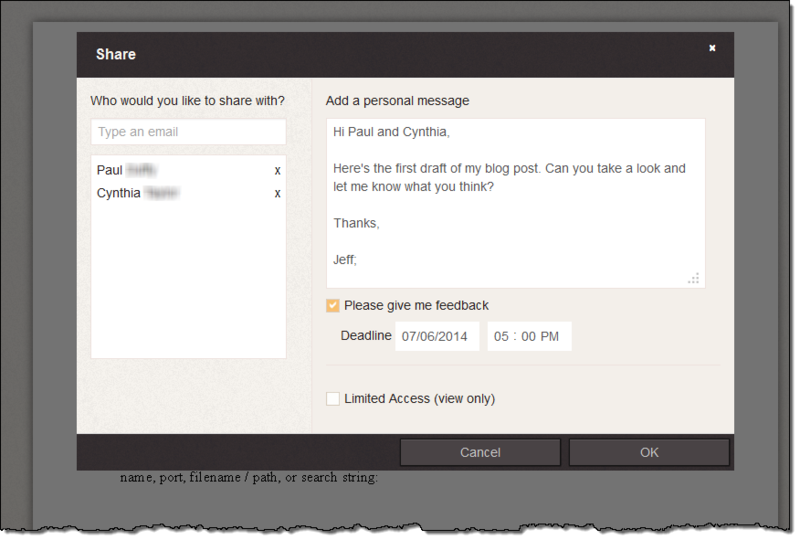 You can upload files of any type; Zocalo will render Office documents, PDFs, images, and text files. 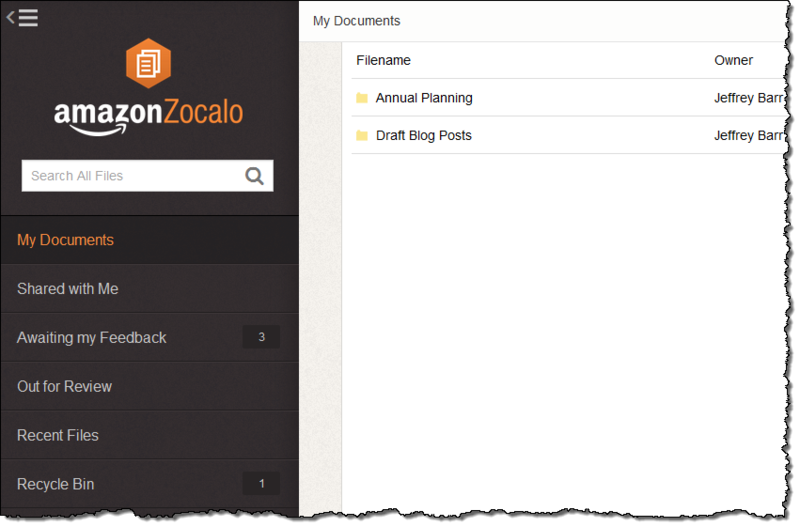 As you may have noticed earlier, I can create folders in Zocalo and store my documents inside. 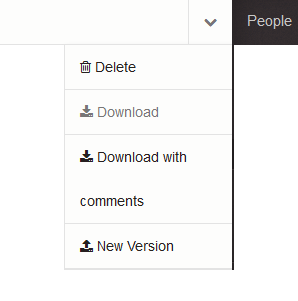 Permissions applied to a folder apply to all of the documents within it, making it easy for me to use folders to organize my documents by project or by team. 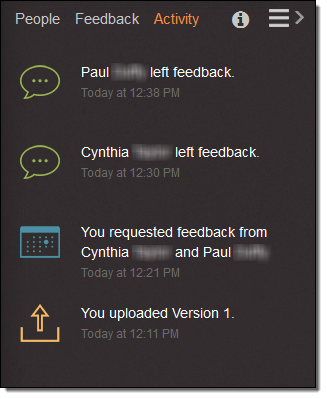 As you can see, clicking on a piece of feedback highlights the target area in the document and also connects it to the comment. 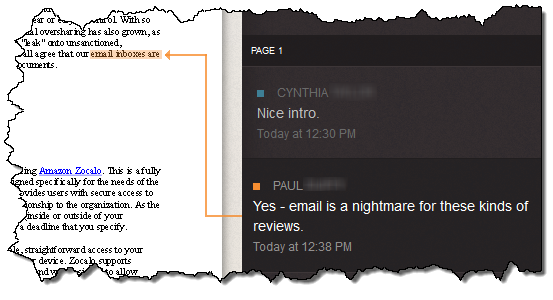 Each reviewer has their own, unique color code as well. If the document is in Microsoft Word format, I can also download a version that includes all of the comments entered by the reviewers. There’s a lot more to cover, but I’m just getting started and this post is already kind of long! 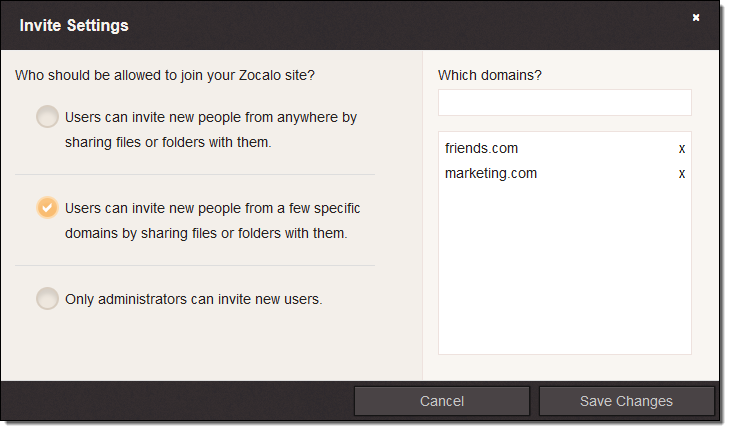 You can try this out for yourself through the Zocalo Limited Preview. As you saw earlier, the owner of the document will be able to see my edits and will (with any luck) use them to produce another version. 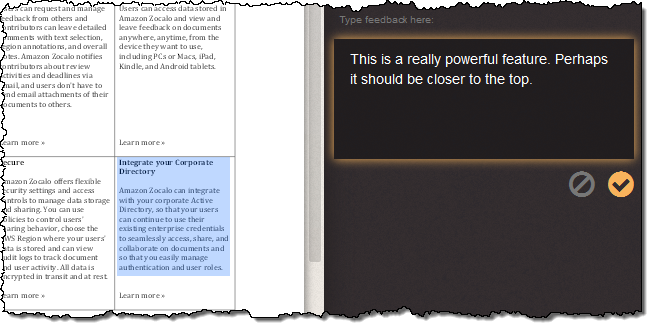 Once again, I have just scratched the surface of the document sharing and review features that are available in Zocalo. Let’s take a look at the administrative side of Zocalo! Each Zocalo account must have at least one administrator. The administrator is responsible for creating and managing user accounts, setting up security policies, managing storage limits, and generating auditing and activity reports. 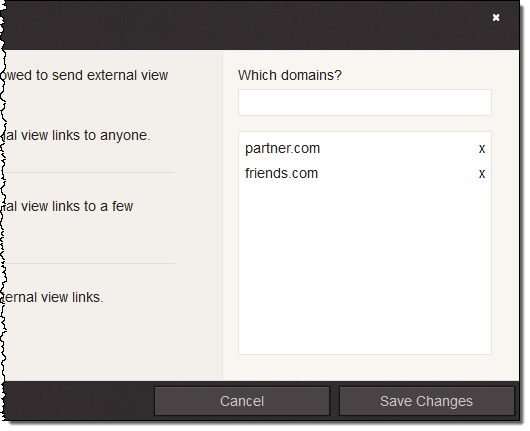 You can choose Quick Start to get going quickly or Full Setup to connect to your on-premises user directory. I set up a password and become the official administrator of my very own Zocalo site! 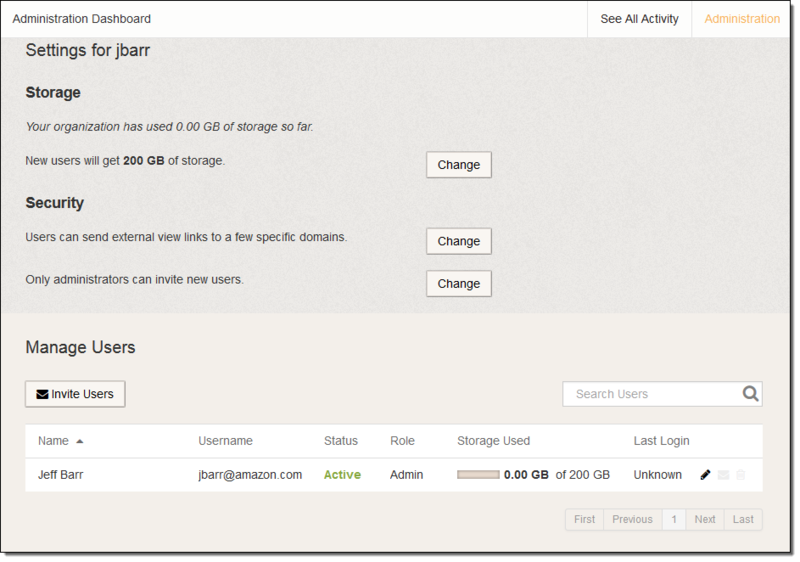 The Dashboard allows me to set the amount of storage per Zocalo user. By default, new users get 200 GB of storage for free. The administrator can choose to allow additional storage, which is billed on a per-GB, per-month basis. Once my Zocalo site has some users, I can monitor and control their storage utilization, and see an audit log of document activity. You can join the Zocalo Limited Preview to experience Zocalo on your own. 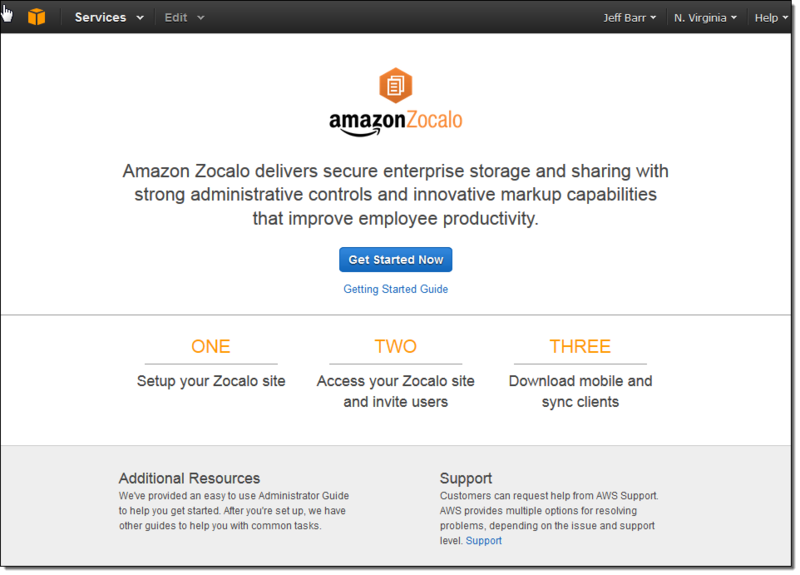 Zocalo was designed to work smoothly with Amazon WorkSpaces. Each WorkSpaces user has access to 50 GB of Zocalo storage, the Zocalo web application, the tablet apps, and document review at no additional charge. The Zocalo administrator can upgrade these users to 200 GB of storage for just $2 per user per month. 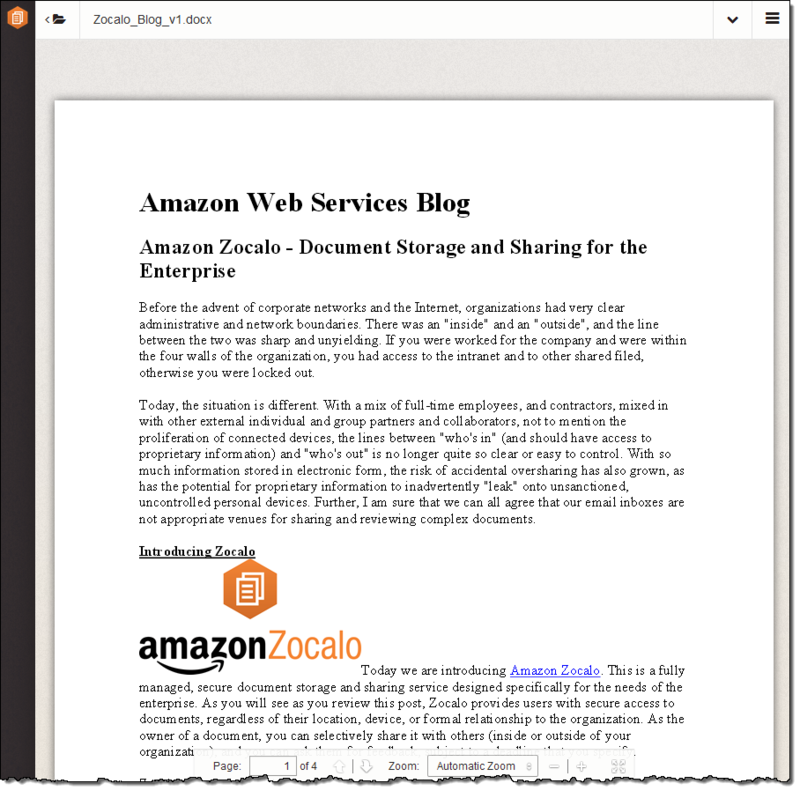 If you don’t use Amazon WorkSpaces, Zocalo is priced at $5 per user per month, including 200 GB of storage for each user. Additional storage is billed on a per-GB, per-month basis using a tiered pricing model. 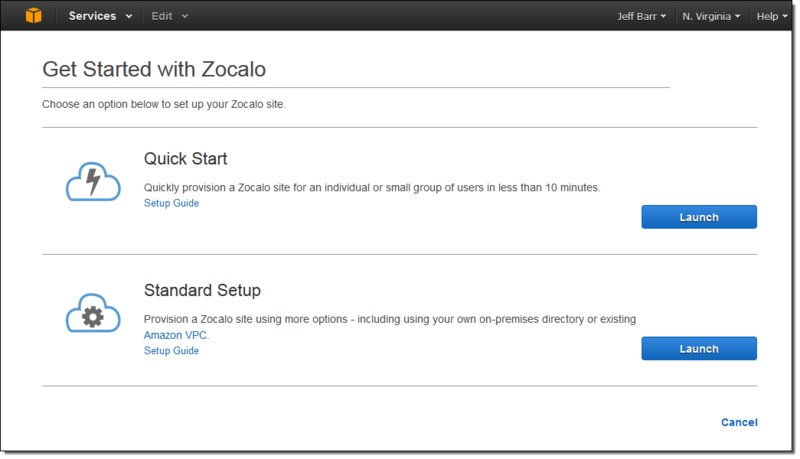 See the Zocalo Pricing page for more info. 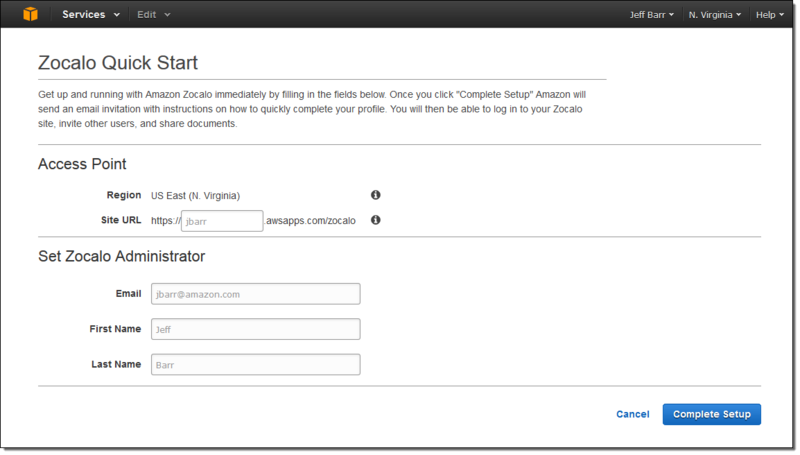 Zocalo is currently available in the US East (Northern Virginia), US West (Oregon), and Europe (Ireland) Regions. All documents for a particular Zocalo site are stored in encrypted form within the chosen Region.